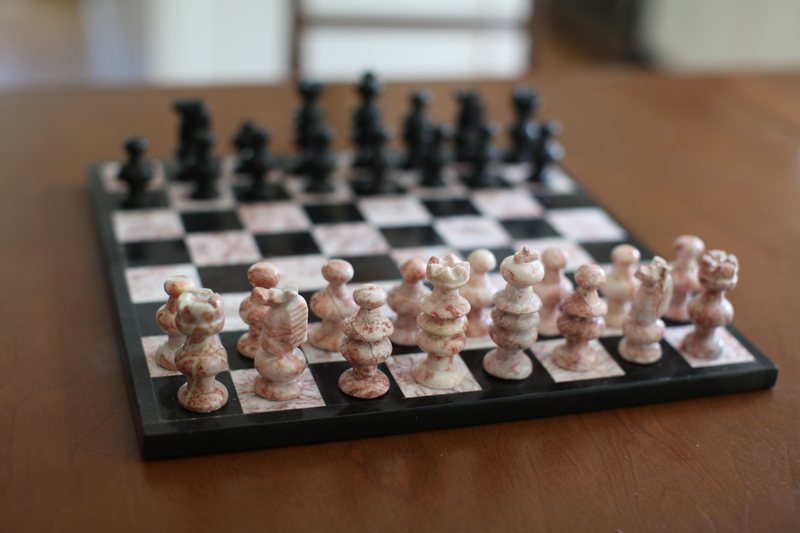 I bought this marble chess set 15 years ago when I was on a summer study program in Mexico. It was one of those spontaneous tourist purchases you find yourself lugging back and questioning afterward. I suppose I rationalized that everyone should own a chess set and I’d get around to learning one day. This set has seemed to follow me around over the years remaining un-played. I moved with it quite a few times and then conveniently left it in my old bedroom closet at my parents’ house. A few months ago my Mom was cleaning out said closet and came upon a bunch of stuff that she thought she would return to its rightful owners. My sisters also had left wanted, yet momentarily unwanted, items stowed there. A box showed up at my door with my letter jacket from high school, the wayward chess set and a few other things I didn’t need but yet couldn’t seem to give away. Chess has always been on a slow simmer in the back of my mind as a game I should play but I never actually wanted to start learning. I saw it as a slippery slope that would occupy a serious amount of mental energy…energy I was more interested in putting elsewhere. In many ways I felt like my job in advertising was like living chess, from the more obvious aspect of my job as a strategist to simply trying to create a sense of order from the chaotic environment that is advertising. The last thing I felt like doing with my time off was more thinking. I think chess is a game you have to be ready to learn. Sure you can jump in and just have fun with it if you like, but if you want to play the way it is meant to be played, you need to be ready to spend time learning how to play. I think the re-emergence of my old chess set on my doorstep was another invitation and this time I’m ready to start learning. I’ve already looked into a few resources to learn and have been reading a great book the past couple days, The Immortal Game: A History of Chess or How 32 Carved Pieces on a Board Illuminated Our Understanding of War, Science, and the Human Brain by David Shenk. This week I not only want to learn how to play but also understand why chess has managed to have such a widespread cultural impact through the centuries. Angry Birds can only dream of having this kind of track record. To learn how to play I contacted a local teacher who hosts chess summer camps and teaches private lessons to pick up the basics of the game. The Boulder Chess Club also gets together every Wednesday evening to play, so I’ll be visiting them to see some games in action. If anyone has any good resources, please send them my way! I am so excited – we have a set at work and I have been dying to learn. Count me in for a below par chess battle. Bobby Fischer Teaches Chess is a good book to use. My son has been playing for a year now and loves it. I am going to try to learn to play this year. You are currently reading Finally ready to learn at 52 To Do.